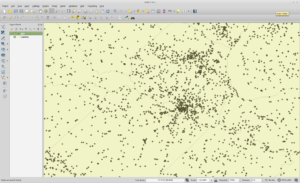 If you have spatial databases such as the ones I set up in my previous blog posts about GNIS and PostGIS, you will likely want to add a few things to them to make them more useful. GNIS and Geonames contain point types of all different classes, from airports to populated places. What if you were only interested in one type of point, such as airports? 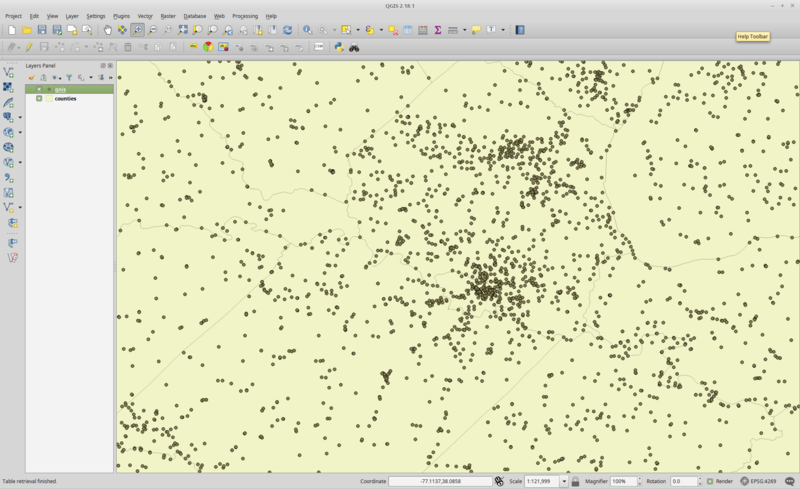 By default, if you load GNIS data into QGIS, it will display all of the points in your view and look cluttered as the screen shot below demonstrates. 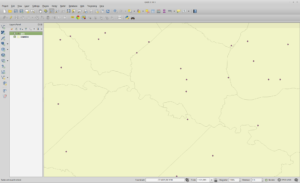 The good news is that you can easily specify what you only want QGIS to show you. There are a couple of ways that you can filter data out in a layer with QGIS: the Set Filter button and creating a database view. The Set Filter button lets you create a SQL filter by clicking on the field you want to filter with, the relational operator, and what you want to compare with. A database view lets you pre-define your filter and presents it as another table. Whichever one you use is up to you, but there is at least one thing you must do to speed up both methods. Once this is done, you will have a new index called gnis_feature_class_idx. This allows PostgreSQL find the matching feature classes from the data more quickly by consulting the index instead of manually searching each row in the database. Both of the examples here will work with the feature class of Airports. These examples also assume you already have some data set up as I previously demonstrated on this blog. For the Set Filter method, first click on the Add PostGIS Layer button in QGIS. Select the USGS database and select the gnis table. Once you have done this, click on the Set Filter button at the bottom right side of the Add Layer dialog. You can use this method to filter out data on any type of field in a geospatial database. I recommend, though, that you first create an index on that column to speed up the operation. Otherwise, you may have to wait a while every time you try to load your filtered data. The second method to filter data is to create a database view. Basically all database types can create a view. For the non-database savvy, a view can be thought of as a virtual table that is defined by a database query. This means that whenever you access the view, the data that is returned is generated by a query. For example, if you wanted a table of only airports in GNIS, you could make a view that pretends to be another table but does not take up as much space as a real table would. When you then go to load this into QGIS, you will indeed see the view as a layer, but there will be a problem. 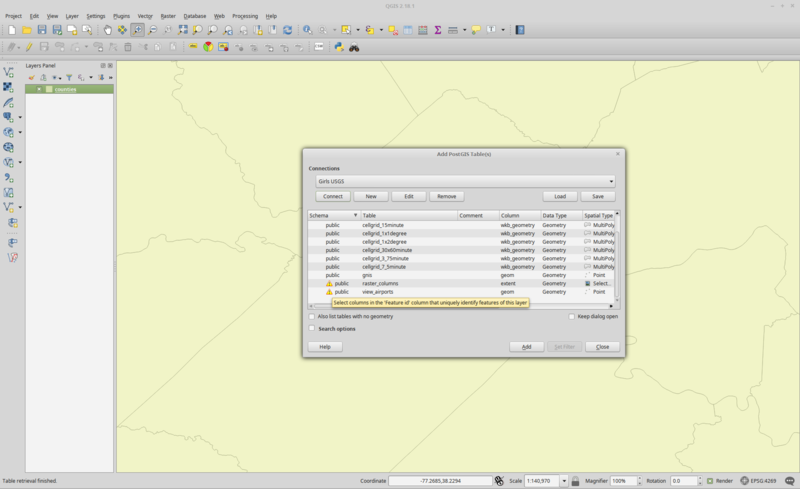 As you can see, QGIS will not let you just click on the view to add it. If you hover over the error triangle, you will see it displays a message of Select columns in the ‘Feature Id’ column that uniquely identify features of this layer. 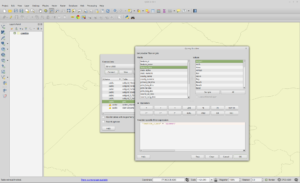 If you scroll to the right, you will see that QGIS will let you select a column in the view that is a unique identifier (feature_id in the case of GNIS). Why does QGIS not automatically know which column to use? If you are not well versed in how QGIS and databases work, tables in a database typically need a unique identifier for each entry so that it can be properly found. With recent versions of PostgreSQL and PostGIS, the view does not have a unique key presented with the view. If QGIS tried to automatically deduce what field to use as the unique key, it would take a lot of processing power and would mean that QGIS would temporarily “hang” whenever you tried to access a database. 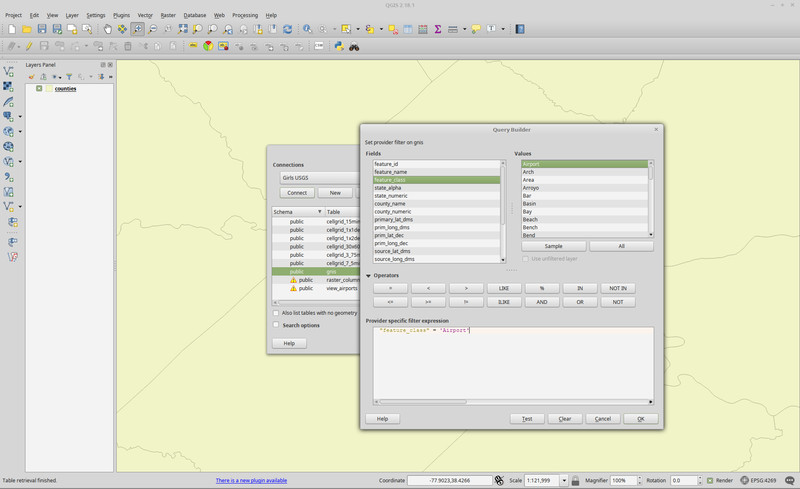 Instead, QGIS gives you an option to tell it what field to use as the unique identifier for each row. If you go ahead and select the feature_id field in the Add Layer dialog, you will then be able to select the layer and click Add to load it into QGIS. Have fun and happy GISing with all Open Source software! This entry was posted in Uncategorized by bigbubba. Bookmark the permalink.